Maternity tabard, made when I was pregnant the first time. 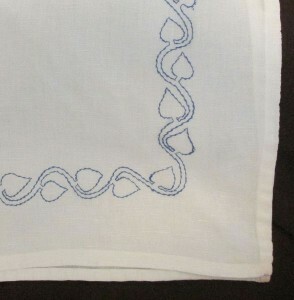 Dover transfer pattern with DMC floss, I have come a long way in stitching and research since I made this piece. 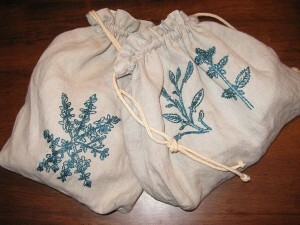 A sample of simple embroidery on a bag. These were used as an A&S prize. The last time I every use red linen thread without checking to see if it is colorfast. Head scarf. My favorite Anglo-Saxon head scarf. 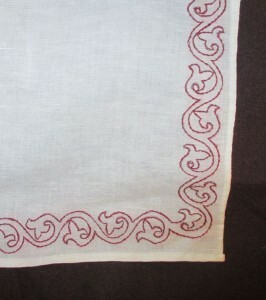 Linen embroidery on a line ground. Not my design but a favorite none the less. I do not sit still well. I like to have something to work on to keep my hands busy. The two Celtic pieces were put on maternity clothes and made with cotton floss. I tend to work more with wool now and I have switched to a more period style of work. The other two pieces are Anglo-Saxon inspired. More Embroidery shows up on a lot of other pages, just explore until you find some. An other old maternity piece. I love the eyes on the critters. My husbands heraldry has a comet on it. I designed an Elizabethan Black work pattern with the charge of his device. The design is a comet, not a flower. 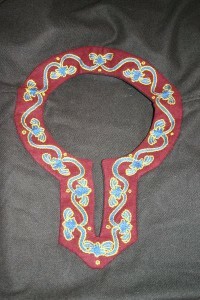 The design is also on the collar. 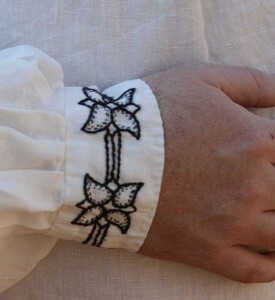 Cuff of an under dress embroidered with an Anglo-Saxon design. 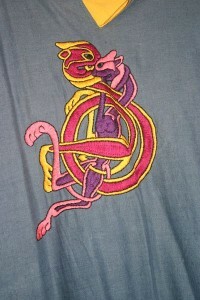 The embroidery is done with wool on linen. It needs a bit of blocking after I wash the under dress. There is a matching wool over dress. 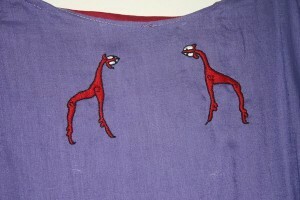 Original design for a wool tunic. 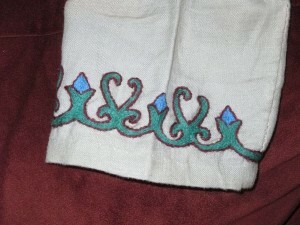 The embroidery is wool and the tunic is wool. It was lovely to embroider.